Rumors of a future iPhone are definitely intensifying. Just over the last few months, a lot of information, including design aspects, have leaked out. That could only mean one thing: the next iPhone is months away from being unveiled. 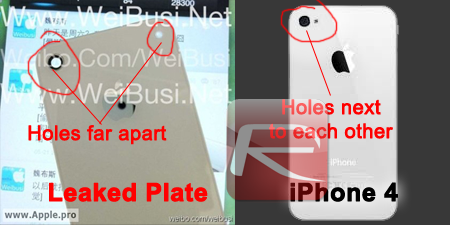 A leaked image by the Taiwanese website Apple.pro, allegedly depicting the back plate of a future iPhone, will only add to the excitement. There have been two kinds of iPhone rumors, ones pointing to a major redesign, also known as the "iPhone 5"; while, more recently, others have pointed to a smaller upgrade, possibly being named "iPhone 4S", much like what the iPhone 3GS was compared to the iPhone 3G. 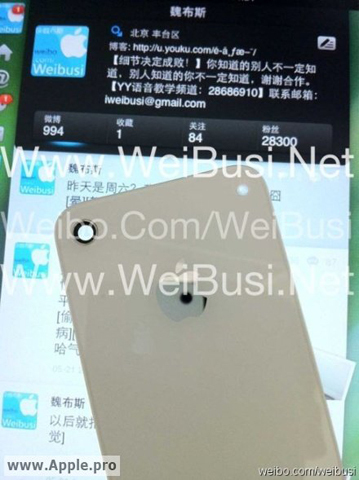 This new alleged leak points to the latter: the next iPhone might indeed be a small upgrade. As you can tell from the comparison above, the only difference between the two plates is the position of the flash: on the iPhone 4 (on the right), the flash is placed right next to the lens; while on the leaked plate (on the left), the flash and the lens are placed on opposite slides of the plate. While this could have been an incredibly easy Photoshop job, pictures of parts are known to leak out when a device is in production, or about to reach it, and employees might have already been able to get their hands on the devices, or at least some of the parts. Furthermore, Apple has ordered less iPhone 4’s for next quarter, which is also evidence a future replacement is definitely underway. This begs the question: why the slight design change? Thankfully, the rumor mill has pretty much answered that question: if we do indeed see an iPhone 4S, it will likely have an upgraded 8-megapixel camera, as opposed to the 5-megapixel one found on the current iPhone. Moving the flash light around might have been the only way to accommodate the more powerful camera. Whether the next iPhone will indeed see a full redesign or not, most factors are pointing it won’t. However, that doesn’t disprove all the "iPhone 5" rumors, since as we’ve learned before, most of them have a glimmer of truth. Back in 2007, Jobs made a comment on how the company was already working on several next-generation iPhones. It would be very hard to believe a company like Apple wouldn’t already be working on at least the next two generations right now. Most of the rumors we’re hearing about a future redesign are most likely entirely true, they just won’t be unveiled as part of this year’s upgrade.